to town for provisions, I thought I'd better cook up a pot of something to have on hand for lunches. The challenge would be to find a recipe that matched the ingredients in my pantry. 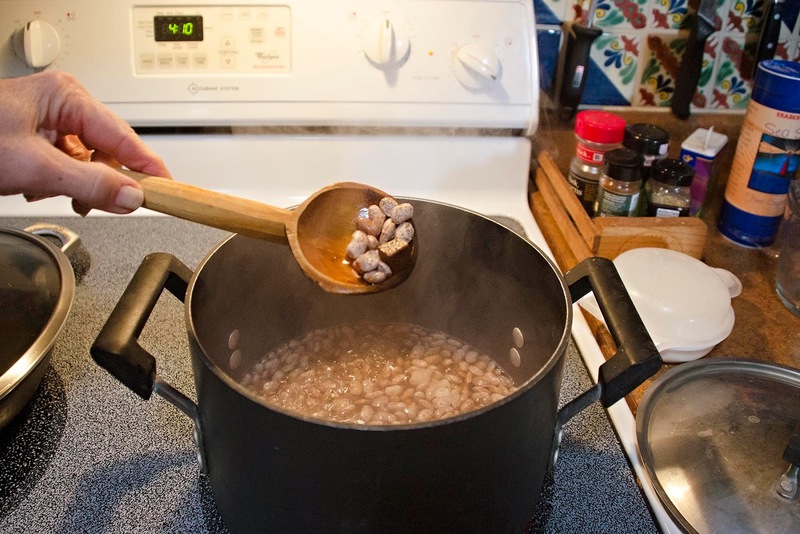 Simple Pinto Beans, and I had a bag of beans, garlic, salt, and beef bouillon cubes in my pantry. Score. Upon closer inspection, I realized my beef bouillon cubes and I go way back. Make that wayyyyy back. where they've been waiting for another 10 years to find their life's purpose. 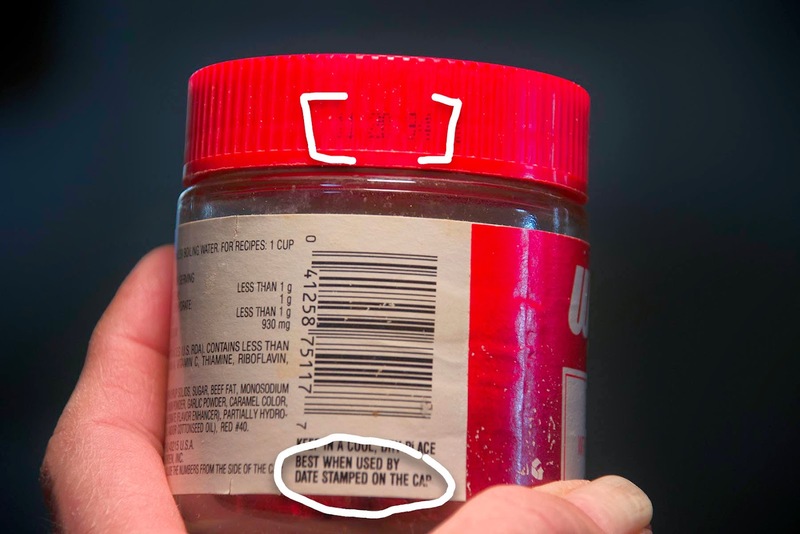 "Best by" dates are for sissies. Yes, and the beans were very tasty. Six lunches later, they're all gone and I've lived to tell about it. Next time you get provisions, pick the items for this enchilada soup. It is so good you will be happy to eat it all week for lunch. We were just stuck home for a week here in TN and so happy to have some of this in the fridge. Be safe ..a bit worried about you without a wood stove! That recipe looks delicious - thanks for the link. My pantry items rotate so often that I seldom have outdated ingredients. The history of your cubes probably enhanced the flavor! Ha! I thought it said 11-20-34! Wow. I never thought of the flavor of beef lasting THAT long! i have found things as much as 10 years old but not this old and when i find them they go in the trash. my hubby is like you. he drinks milk that has expired and anything because HE says the date doesn't matter. since you lived to post this, it must have been safe. A lone rancher and favorite blogger was hospitalized today with severe but mysterious ailment. "It looks like symptoms of an ailment we eraticated 20 years ago, said the doctor, I don't understand it." The victim has not spoken apart from mumbling something about "sissies". We'll keep you posted. Oh, Sigrid! I laughed so loud at this! But she got a few laughs out of her blog readers, so her culinary experimentation was worth it after all. For me it would be a non-starter ... can't handle the sodium and other ingredients (see the 'Monosodium' in the ingredient list ...). It doesn't play nice with me. Some canned tomatoes (garlic & oregano, or fire roasted) ... ROTEL Original !! extra garlic, onions and pepper will spice up the beans. My mother uses sauteed onions & garlic, rinse a can of black beans ... one full can of Rotel original , heat it up and you have a spicy side dish or a good base for a quesadilla. When I first saw your picture of the boullion, I thought it said 34 (not 94)! Even more of a record. The beans look tasty. But I am with you on the best by dates. I once ate yogart I found in the back of the fridge (I know, I should be ashamed) that was six months old. It was a little tart! But no ill effects. It's already curdled milk, right? But I also have found dried things and spices from another decade! This cracks me up. I think almost everything in my pantry is expired. Every time I find something in there that was dated before the millennium, I'm like, "I could have sworn I just bought this last weekend!" How time flies. I also have been finding a lot of food that belonged to my mother, which I moved from her house in 2011 to my house in NV and then to my house in AZ, and I'm always wondering if it wouldn't have been easier to just throw it out instead of packing and unpacking them. Pantries are as good as time machines. Apparently we are food hoarding kindred spirits. My husband (and friends) yell at me all the time for having things in the cupboard that are, ummmm.... elderly. Since I am also an odd foods hoarder, it gets better. I do believe I have some seaweed in my cupboard that is at least 23 years old. I have some nutmeg that's at least 25. It still makes good oatmeal cookies. Like you said - Sissies! I think I'll get some bouillon and put it in my survival kit. I won't need to change it up. My depression-era mom has you beat. I recently cleaned out her house for a move, and she was furious at me for throwing away "stuff that was still good". Included were salad dressing from 1989, Tylenol and sunscreen that expired in1986! Oh how this made me laugh!! Our cupboards have a few hidden gems that were 'born' that same era! Now make sure you keep posting this week ore we'll start to worry that those cubes got the better of you! That is epically awesome. I once had a bottle of ketchup in the fridge that I finally REALLY looked at. I realized it had gone through three moves over 12 years and was from a long-bankrupt grocery chain. Guess I don't eat ketchup very often! But your beans look delicious! This post cracked me up! You have vintage spices. Glad you enjoyed the beans. Best if used by only means for the best flavor use by. Use by means it will go bad about a week after that date, milk last a week or ten days after the date. Keep milk on the shelf of the frig. instead of in the door and it will last longer, every time the door opens it gets a little warmth to it if in the door. I keep mine on the shelf in toward the back. As if knowing when SOUR cream has gone bad wasn't hard enough, I once had a container marked to expire on August 35! Ha! Vindication! Great list. Thanks for the link.